Mon Cher is the cute, perky one in the group. She loves to dress up and plays the concertina (the Cajun accordion) for the Swamp Kids Band. She's the kind of girl all the guys would welcome as a friend. She loves to dance while she plays her sweet music. Mon Cher is a caring and loyal friend but sometimes appears aloof to those who don't know her well. TuTu is the mischievous one in the group. He loves to have a good time and particularly enjoys spending time playing all types of sports. For the Swamp Kids Band, he provides the signature sound of Cajun and Zydeco music playing the scrub board he carries on his chest. He can be found dancing around the campfire whenever the music cooks up. 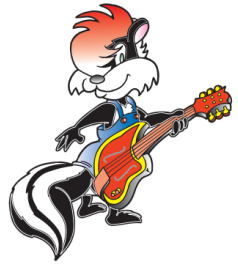 LaFleur is the "rocker" in the group in the way she looks but loves to play all kinds of music, her favorite being Bonnie Raitt. She comes from the edge of the Bayou and dresses a little differently from the other "Kids". She can be a little "rough around the edges" but has a very big heart. If ever a problem arises or bullying starts to occur, you can bet that LaFleur will be side-by-side with Pierre standing up to those causing the trouble. Our newest addition to the Swamp Kids family of friends is “Cat” from the adventure, A Dog Named Cat. He is a loveable Catahoula Cur puppy that the Swamp Kids adopted from the local S.P.C.A.! He fits in perfectly with his new friends on Bayou Bleu. He is a joy to play with and loves to run and jump around the banks of the Bayou, chasing anything from rabbits to squirrels to butterflies. His coat is covered with spots and soft as can be and his eyes make him special; one glassy and grey in color and the other blue as the sky!